1. Pat performs a card trick that stuns Gil Stubbs. 2. Magician Pat Farenga performs Los Cubos. 3. Pat demonstrates a psychic force field. Pat performing walkaround magic in a restaurant. Pat doing closeup at optician's promotional event. Performing on television with two young assistants. Pat sees through bandages and a steel blindfold! Not your typical magic show! 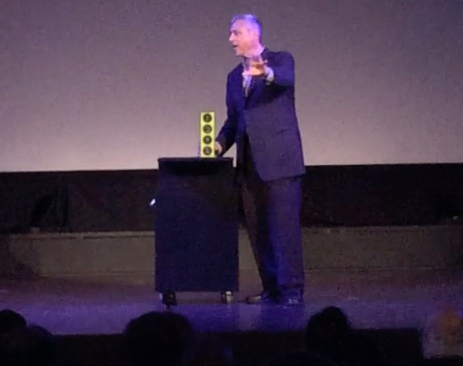 Fascinating magic, lots of audience interaction, and plenty of laughs are Magician Pat Farenga's recipe for a great show. Pat enjoys working with you to plan the best event, birthday party, or cocktail hour you can imagine and then making it happen. 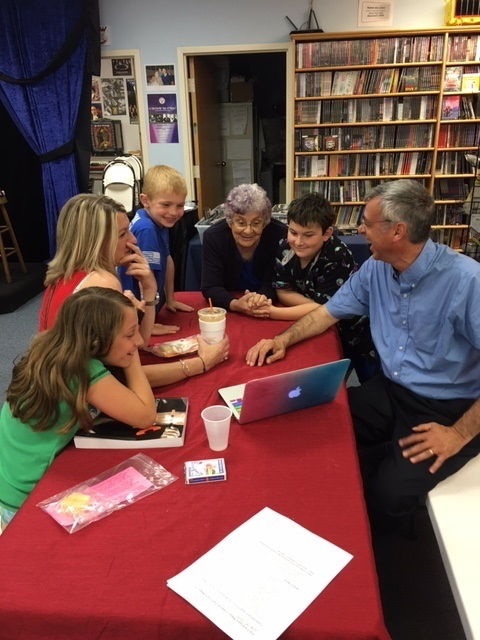 Pat also enjoys teaching magic to children and adults, and teaches magic in public and private schools, and in homes. He can also add lessons and tricks to his show that your guests can take home to perform for friends and family. Pat did a Harry Potter themed magic show for our 6-year-old daughters birthday and 24 of her "closest" friends. The kids had a great time and it was the highlight of the party. He personalized the show to make my daughter the star and she loved it. Pat was amazing and very professional. I highly recommend him with no reservations. When the time comes again, I will definitely be using Pat again. Pat was great with tailoring a show to younger kids and working around weather and other issues. Thanks again and would absolutely recommend. Hands down The BEST !! He is so personable and a true professional. We had a Harry Potter themed birthday party for our 8 yr. old and Pat did such a wonderful job incorporating the theme into his act. The workshop that followed the act was an extra treat for the kids, where he patiently taught the kids a few tricks. Thank you Pat for making our party a success! Pretty good show offered by Pat for my daughter's birthday. The price was decent for his magic stuff. I completely recommend him for your kids parties. Fantastic! Kept the kids focused and entertain for the entire show. The trick were great and the kids really enjoyed it. Pat was amazing, the children loved the show. Thank you soo much. Pat was professional, friendly and the kids loved his show and tricks! Adults even enjoyed his humor and calm demeanor with the kids. Would definitely recommend him for any event. Thank you for the kind words, Lyndsey. And thanks for the nice photos of me and Chase! Pat did a great job entertaining the kids (and adults too)! He involved the children in almost every trick. My daughter loved it and he even left her a few souvenirs too. Thanks Pat! Kids loved him. Adults thought that he was good! Pat did a great job. The kids thoroughly enjoyed his show! Pat was the best children magician we had witnessed so far. He was very patient with 2yo and 3yo crowds we had and he delivered his magic very well. My kids were very happy and cannot stop talking about him . Thank You Pat for entertaining d kids . Super nice guy who really kept the attention of 10 9-year-old boys throughout his show and included everyone in his performance. 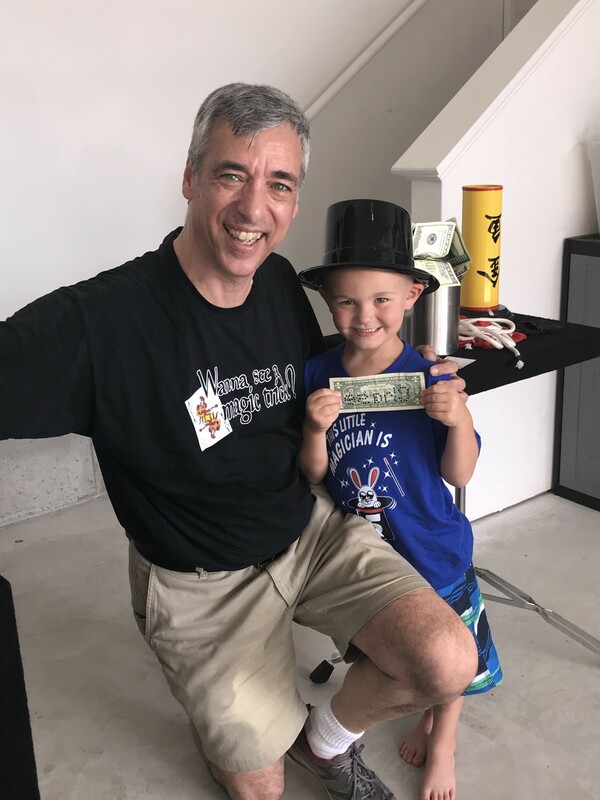 Very accommodating and willing to work with my son who is a budding magician. Pat did a great job at my daughter's 5th birthday party. The tricks amazed the kids as well as the adults. Thanks again, Pat! Pat was great for my daughter's 7th birthday party. He engaged the audience (around 30 kids) and kept it entertaining. Would highly recommend him. Pat did a wonderful job holding the attention of all the kids, ages 3-10, for 45 minutes outside at a block party He involved 6-8 kids as his helpers, which all enjoyed. While some of his references went over the heads of the little ones, they didn't lose interest. He also stuck around for 10 minutes at the end of his performance, showing the older kids some tricks. The adults enjoyed him, to! Thanks you again and we will be in touch for future events. We hired Pat for a family Christmas party of 45 guests ranging in age from 1 to 76. While the older members enjoy socializing the younger ones can be bored so we especially wanted the fourteen of them (ages 3 to 17) to enjoy the party. Pat accomplished that. He was very gracious in delaying his performance until some of the late guests arrived and then, to their delight, he involved the young people In his performance. I'm sorry to say I cannot recommend Pat for a magic show to entertain guests. My guests and I were hugely disappointed in this show. It was as if he just started in the magician field, instead of one he claims years worth of experience. He appeared nervous and uncomfortable in front of the crowd of 40, fumbling with broken equipment and not perfected acts. I cannot recommend Pat for more than a show with 5 year olds in the audience. I'm sorry. I'm so sorry my show was disappointing—it was a difficult day for me—and I want to offer you a full refund. I have contacted you offline to do so. Pat magic show was awesome ! 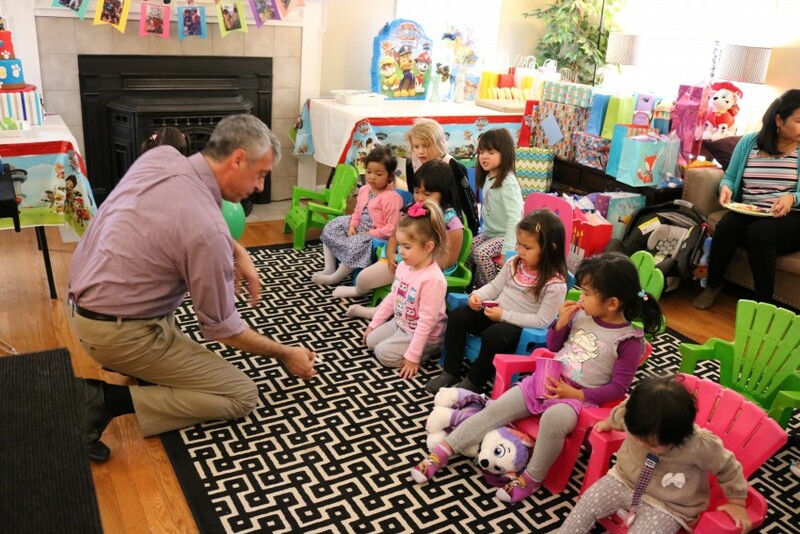 Pat's magic show was a big hit in our daughter's 1st birthday party, both kids and adults were equally entertained. We had kids ranging from 2-10 years, Pat kept them engaged by involving them as a part of the magic and they all loved it. Working with Pat to plan the show was hassle free, he gave us ideas to plan the agenda, was willing to be flexible with his schedule, followed up couple days before the show to ensure everything was on plan and was on time for the show. We would highly recommend Pat and look forward to working with him on another party again. Pat - Thank you for making our daughter's first birthday a very memorable event. 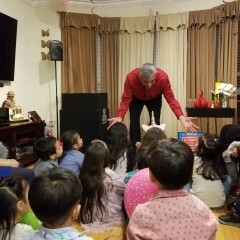 Pat did a wonderful show for a group of 6 year olds at my daughter's birthday. Pat recently came to my school for a performance and did NOT disappoint. He was humorous, entertaining and the magic tricks were fantastic. I happened to be sitting next to a few 6th graders who were "non-believers" in magic at the beginning of the show, thinking they knew it all. By the end of the show, they were amazed, astonished and were asking questions about the different tricks. 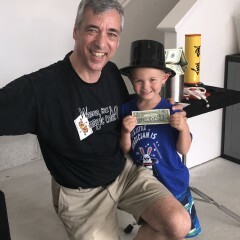 Such a fantastic magic show and magician! Magician Pat Farenga performed at my sister's surprise 60th birthday party. The ages of the audience ranged from 2 to 65. Everyone enjoyed the diverse format of the magic show and talked about the tricks long after the performance. Everyone was focused and consumed by curiosity and great interest during each part of the show. I highly recommend this Magician! Pat helped me out when I was in a pinch, and he did a good job. The kids really seemed to enjoy the show and have fun! Thank you Pat! Pat was great! Our doctor’s office hosted a special event in which we see 100 children all in one day. 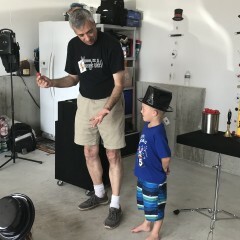 Pat entertained with children’s magic from start to finish, and the tricks he performed were amazing! The kids were so entertained, they did not want to leave! We will definitely be inviting him back next year. Pat is a pro pure and simple. With an uncanny ability to read his audience, his act dazzles young and old alike. A life-long magician, he also teaches up and coming conjurers. Mixing wit and humor, his act will surely make your event or party unforgettable. Pat saved the day for my twins birthday party which almost got rained out... He had all 28 kids fully engaged and laughing throughout the show. He even taught some if the kids trucks! Highly recommend him. I just wanted to say THANK YOU for such a great performance Saturday night, it was enjoyed by all, believe me, the adults as well as the kids were amazed by your show and were still talking about it yesterday. Thank you again for taking the time to help support Matt's a Fundraiser and was a great time and huge success. Pat performed at my son's fifth birthday party and had a crowd of gadget-loving kids eating out of the palm of his hand. He's easy to work with and knows what a crowd of kids wants. I'd highly recommend him for your next birthday party or even business event. a great magician with a unique personality! Have you ever been into a magic show and laughed so hard with every trick you watched the magician performed? If your answer is no, then you haven't seen Pat and his unique style of comedy magic! Children will love him, you will be amazed and most important, your guests will come up to you to thank you for hiring Pat. Are you ready for a unique magical experience? Then Pat is your guy! 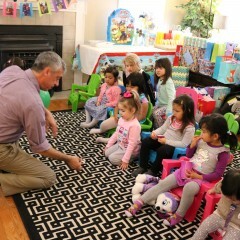 Your birthday child will be the center of attention for key moments during the one-hour magic show. 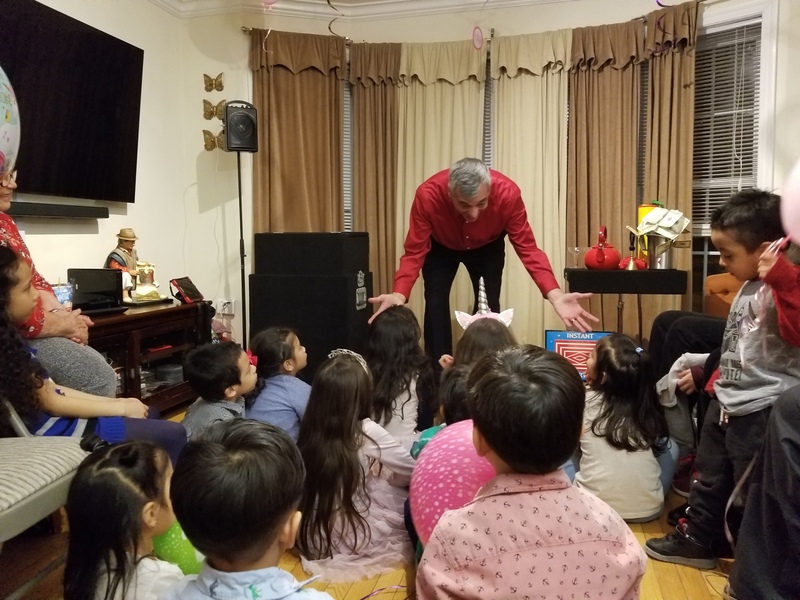 Fascinating magic, lots of interaction with the audience, and plenty of laughs keep children and adults at the party amazed and happy. If your party has a theme, Pat can incorporate it into his act for you. Candy, goodie bags, or other special treats can be magically produced and handed out by Pat at the show. Pat has been performing since he was a young boy in the Bronx ; he studied magic with local professional magicians and continues to perform as a young-at-heart man in Boston. By day Pat works as a writer and editor but, by night, he is a devotee to the conjuring arts. Pat is an active member of the International Brotherhood of Magicians, Ring 122, and edits their newsletter and website. 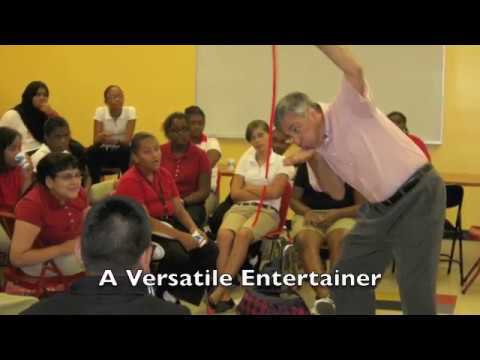 Pat performs different programs depending upon your needs: close-up, strolling magic for indoor and outdoor events; imaginative tricks and themes for children's birthday parties; educational entertainment for schools and libraries; and stage shows. 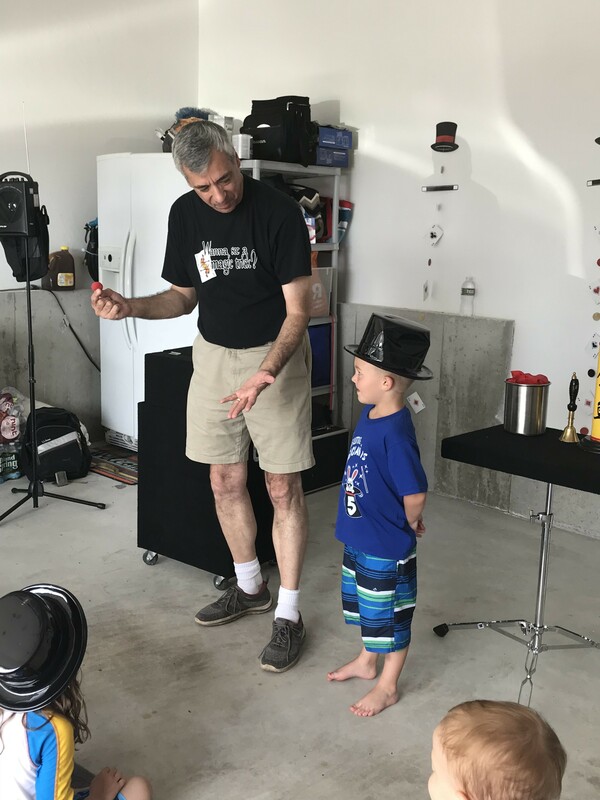 In addition to performing for children and adults, Pat teaches magic to students of any age, individually or in a group. He also teaches after-school magic classes in public and private school, and homeschool settings. I will bring all the equipment, including sound if needed, for children's parties. I've been influenced by magicians Doug Henning, Frank Garcia, and David Copperfield in particular. I bring everything (sound system, backdrops, etc. )needed for small venues (audience size of 250 or less). For large stages I need to know what lighting and sound equipment is available to me. Thanks SO much for yesterday! All the of kids LOVED you, especially my daughter, lol. She already said she wants you at her 5th Birthday party . . . and that isn't until March!! !